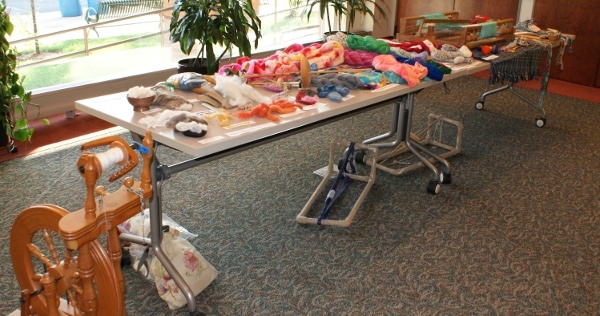 I have been teaching fiber arts in person since 1992, and online since about 1996. That's twenty years! I have to admit, Stringpage is showing its age. I'm working on a complete overhaul, but it's slow going. Until then, please enjoy this antique. My specialty is historical textile techniques, especially those like braiding and tablet weaving that can produce very complicated structures with minimal equipment. I'm also interested in popularizing obscure techniques like sprang and naalbinding. There's history and technique information for some of these things available through the links on the left. The site blog, String Notes, is now the place for tips, tricks, book reviews, and other assorted less-formal or shorter writings. I help to run a SCA fiber arts symposium, FFF, the weekend before Thanksgiving in Lamar, PA. All the years of class lists are online! In 2018, FFF will be held from November 16-18. The class list for this sixteenth year is rapidly growing.